Born: 28 January 1874, London, England. Died: 9 July 1920, Nakuru, Kenya. 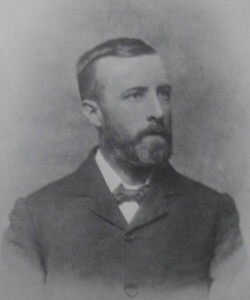 Frank Flowers, son of Joseph Ingram Stevens Flowers and his wife Elizabeth, arrived in the Cape Colony from England in 1888 and completed his schooling here. After a brief spell with a chemist, W. Nolan, in Johannesburg he was appointed as a government dispenser in Port Elizabeth. From 1893 he worked as a chemical assistant at the leper and lunatic asylum on Robben Island, but in 1895 joined the drainage engineering staff of the Cape Town corporation where he remained to 1902. During the Anglo-Boer War (1899-1902) he was employed in the mapping section of the Field Intelligence Department for some time. He may have studied at the South African College during 1901, as a certain Frank Flowers was enrolled there for that year only. In 1902 he moved to Johannesburg where he bought the map office of Wood & Orttepp. By this time Flowers had been elected a Fellow of both the Royal Geographical Society and the Royal Astronomical Society and was regarded as a civil engineer. He became a foundation member (later a life member) of the South African Association for the Advancement of Science in 1902. In 1904/5 he served as a member of the association's council, representing Johannesburg. At the joint meeting of the association with its British counterpart in 1905 he became a member also of the British Association, and after the meeting was the sub-editor for Section E (Geography) of the three volume work Addresses and papers.... In 1906, at the association's annual meeting in Kimberley, he read a paper on "Geography as a factor in higher education", of which an abstract was published in the Report for 1905/6 (p. 213). He served as a member of council for the Witwatersrand from 1907 to 1910 or later, and in 1912/13 as a member for Mozambique. At the annual meeting in 1913 he read a paper titled "A plea for the more exact measurement of rainfall". In 1895 Flowers married Frances ("Fanny") Cecilia Emily Dickens, with whom he had three surviving children. Frances Cecilia Emily Flowers (born Dickens). My heritage. Retrieved from https://www.myheritage.com/names/frances_dickens on 23 November 2016. National Archives Repository (TAB), Source MHG, Vol. 0, Ref. 44683: death notice, Frank Flowers. South African Association for the Advancement of Science. Report, 1903-1908, 1910, 1913, 1918.